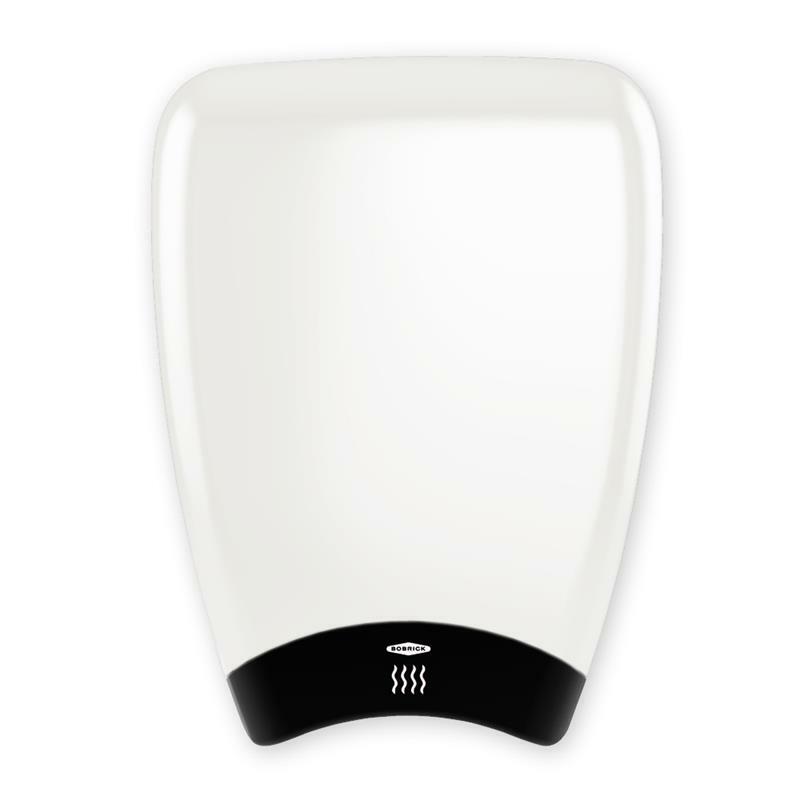 The latest Bobrick ADA compliant, ultra-slim hand dryer housed in a stunning new design. 4" projection compies with ADA guidelines without the necessity of recess mounting. Touch free infra-red sensor helps minimize the spread of germs through contact. Sturdy die cast aluminum cover with white epoxy finish. The wide nozzle configuration allows for quick dry time with only 69 dBA sound level! Available in 115V or 230V, 50/60 Hz, cULus Listed. Cover One-piece, aluminum die-casting with white high-gloss epoxy finish electrostatically applied. Nozzle Integrated black ABS vandal resistant grill & wide outlet. Activation Automatic (infra-red), 90 second safety shut-off. Motor Universal, 1/7 hp, 8000 rpm, on resilient mounting. Sealed ball bearing at drive-shaft end and self lubricating sleeve bearing at non-drive end. Automatic thermal-overload switch. Heating Element Coiled Nichrome heating element, protected by integral automatic thermal overload device. Located on fan inlet, to heat air without hot spots and remain inaccessible to vandals. Dimensions 10-1/8" Width x 13-3/4" Height x 3-15/16" Depth. Warranty 5 yr. limited manufacturer's warranty (motor brushes, 3 yrs.). Need something more upscale? Try the gorgeous Dyson AirBlade "V"
No-touch operation: electronic sensor automatically turns dryer on when hands are held under air‑outlet opening and across path of sensor. 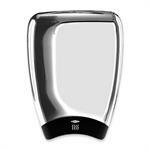 Dual air outlets provide a swirling circulation of airflow for comfortable hand drying. Drying time less than 25 seconds. Remove hands from path of sensor and dryer stops. Dryer operates only when actually drying hands, which saves energy and operating costs. Electronic sensor will automatically shut dryer off 1-1/2 minutes after dryer turns on if an inanimate object, such as tape or chewing gum, is placed across air-outlet opening. After inanimate object is removed, electronic sensor automatically resets itself and dryer operates normally. In addition to Bobrick’s one-year guarantee, Bobrick extends a limited 5 year warranty from the date of purchase for Model B-770 and B-778 hand dryers on all parts, except motor brushes, to the original owner of the installed unit against defects in factory workmanship or material under normal use and service. Motor brushes are warranted for 3 years from date of purchase. This warranty is limited to the repair or exchange of defective parts at the option of Bobrick.